Global Synthetics provide a range of prefabricated fin drains wrapped in geotextile that provides the designer with the opportunity to minimise trench widths whilst maintaining efficient flowpaths. 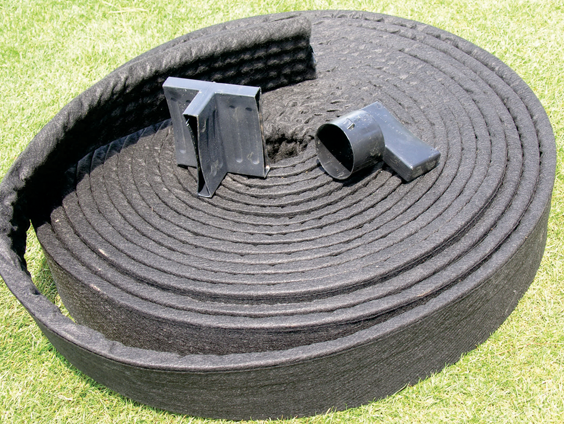 Global Synthetics edge drains provide a very positive intercept to the infiltration of water to the pavement. PaveDrain® edge drains come in a variety of width of product and depth of product. These edge drains are widely used in highway drainage applications throughout the world. PaveDrain® is a proprietary product consisting of a flexible geocomposite plastic strip filter cuspated core encased in a geotextile filter forming part of the structural composite. Pavedrain® core is manufactured from virgin HDPE that has proven to be a long lasting durable polymer over decades of construction use. The core has a cuspated profile for the efficient discharge of water whilst maintaining good structural integrity during placement and service conditions. The core has high compressive strength with minimal deflection under load. For further information please refer to the Technical Documents located on the right.